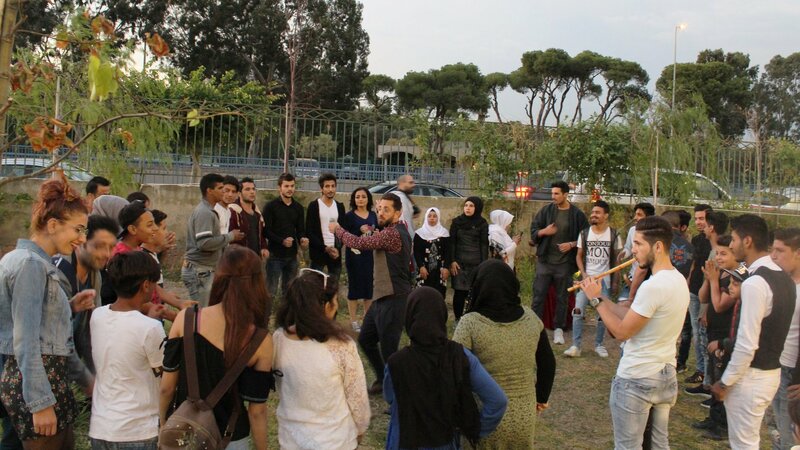 Right To Play and Silkroad use the universal language of music to bring young people from different population groups in Lebanon together to get to know each other and strengthen social cohesion through artistic play. The pilot project "Building Bridges through Music" was launched in 2018 to build bridges between Lebanese, Syrian and Palestinian youth. The programme offers young people a platform for dealing with their rights. In various workshops, young people can strengthen their personal and social skills, such as self-confidence, empathy, communication and conflict resolution skills - competencies that are crucial for representing their interests and personal development. Career prospects for young people in Lebanon are low. High unemployment and poverty exert pressure on the families of refugees and host communities. Even before the refugee crisis, a high percentage of people lived at or below the poverty line. A comprehensive study by various UN organisations has shown that young people from refugee countries and the host country generally live in isolation from each other and have no intercultural social connections. In addition, many young people are intimidated by the strong competition on the labour market, avoid contact with the authorities and are worried about their future. These fears are particularly high among young refugees living in poverty. In cooperation with Silkroad, a non-profit organization initiated by the cellist Yo-Yo Ma, Right to Play encourages creative learning through music. At the beginning of the project, 20 adolescents who are affected by poverty, violence, lack of infrastructure or environmental pollution were trained to become coaches. They have shown great interest and the necessary skills to pass on their knowledge to a group of young people. During the regular meetings among the adolescents, the coaches provide information on human rights and child protection and teach music knowledge and basic music theory - tools for reflecting and expressing social issues. The coaches encourage the young people to work together and assist in the preparations for a large public concert with the Silkroad Ensemble by the end of the pilot project. This allows a vivid exchange between the population groups. Until today, 210 disadvantaged young people have already benefited from the artistic play. Right To Play's goal is for a total of 300 adolescents to benefit from the pilot project in Beirut by the end of July 2019.